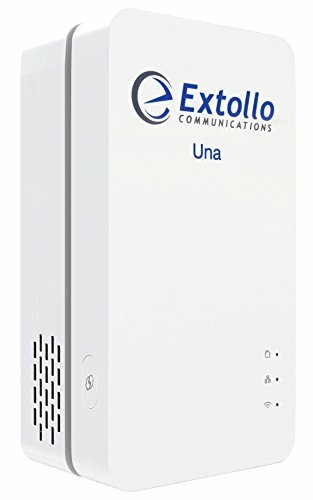 Una is an intelligent self managing dual band, dual concurrent, AC1200, MU-MIMO, 2x2 802.11n/ac meshed wireless distributed networking system that features both Wi-Fi and Powerline technologies. Multiple Una wireless Access Point's (AP) allow you to create a meshed Wi-Fi system or extend your existing Wi-Fi network when combined with the LANPlug 2000. Simply plug Una directly into an electrical outlet in an area that has poor or no Wi-Fi coverage to resolve Wi-Fi dead zones. Una's dynamic band steering and multi-AP coordination determines the best possible Wi-Fi connection and optimal performance for each attached device. Una optimizes network capacity by reducing network congestion and auto-selecting the fastest available connection for each device. Una knows which devices are connected and autonomously manages those connections by forwarding traffic to the appropriate AP or frequency band depending on the type of content and distance from the AP. Seamless roaming ensures that the appropriate bandwidth is available when and where it's needed, whether it's transferring a file, streaming UHD/4K video or web browsing. Una provides ultra-reliable coverage and performance, due to its use of G.hn Powerline backhaul as the communication backbone between meshed Una's. Powerline backhaul technology overcomes the coverage limitations of conventional wireless meshed network systems which use wireless radios to communicate between each other. The integration of Wi-Fi and Powerline backhaul working in unison provides better Wi-Fi coverage for the whole home. Self configuring, Una automatically performs a topology discovery to locate and authenticate other Una's on the Powerline network. It then performs an auto synchronization of the Wi-Fi parameters. Not compatible with the LANSocket 1500. Requires 2 or more Una's to create a meshed Wi-Fi system or 1 x LANPlug 2000 & 1 x Una to extend your existing Wi-Fi (search "WLANXtndr Kit"), universal compatibility, works with any router. Imagine, corner to corner wireless and wired coverage for your entire home with seamless roaming over a single network. Una integrates Wi-Fi, Ethernet and Powerline technologies working in unison to eliminate dead spots and ensure faster connectivity for total home network coverage. Ultra-fast AC1200 Wi-Fi and Gigabit Ethernet combined with Powerline Backhaul technology that scales to fit homes of any size or shape - one Una covers 1,500 sq. ft. Intelligent Roaming keeps your devices connected to the strongest Wi-Fi signal as you move throughout your home. Single Wi-Fi name (SSID) for your 2.4 GHz and 5GHz wireless networks because Una knows what your devices are doing and connects your device to the best wireless connection.